Writing a dentist biography can be tricky. This is your one chance to appeal to the person visiting your website on a personal level, which is very important because for many, hiring a dentist is an emotional investment as well as a practical one. Sometimes seeing a sample bio can help. You want to be able to showcase your dental professional skills in a manner that will leave the reader reassured of your competencies, and either want to seek you out to learn more (for those searching for services), or be satisfied with what they have learned (for those reading the dentist bio for any other reason than becoming a potential customer). You do not, however, want to create a bullet list of credentials that will make you sound pretentious or stuffy. We can help you find the happy medium. 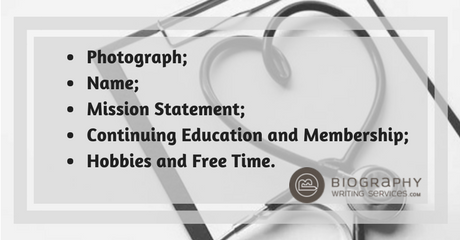 We understand writing the dentist biography section of your website can be challenging. A mission statement by nature is succinct yet comprehensively grounding and is a sound option to include. A pleasant, professional portrait is needed. People like to know where you went to school. A short section on where you were educated is common and is almost always found in a good dentist bio. Information about the education need not be lengthy. Simply writing where you earned your dental degree is sufficient. You do not want to include information on undergrad degrees or other majors. Continuing Education and any memberships you belong to may be included, just so long as they are not overly extensive in number. The most important part of the dentist biography, however, is going to be the “About Me” section or the place where you list your hobbies and note what it is you enjoy outside of work. This lighter element to the page allows readers a way to relate to you as a person and not just as professional. At the start of any good dentist bio, you will want to put a professional photograph that shows you with an easy, welcoming smile. This is an element to the biography that you do not want to omit. Potential patients want to see what their dentist looks like before they come in to visit. It takes away the element of surprise and makes them comfortable when they spot you in the office. After the photograph, you will want to add your bio information as shown below. (something that allows the reader to relate to you as a person). Dr. Doe’s mission is to provide comprehensive dental services to all patients in an environment that is safe, reassuringly pleasant and comfortable. Dr. Doe is a member of the American Academy of Cosmetic Dentistry and continuously seeks out training and professional development opportunities that allow her to remain aware and knowledgeable about new dental practices and the latest technology being considered or used. In her free time, Dr. Doe enjoys whipping up new recipes in the kitchen, bicycling, and cuddling with her new twin puppies, Tina and Thomas. 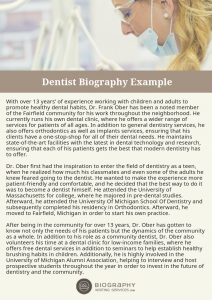 As you can see, from the dentist biography sample, you are providing a quick overview to the reader of not only your credentials, but you are also giving them some insight as to who you are as a person. 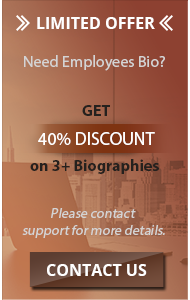 In case you’re feeling overwhelmed with bio writing, one of the most effective solutions will be to hire a professional bio writer and get a bio that truly stands out. Now that you know what to include, you should also know what not to include. This is not the place to extensively tout your accomplishments and accolades. While patients do want a winning dentist, providing information about medals, awards, trophies and the like on the bio could make you sound pompous or self-centered, which you, of course, do not want to do. You’ll also want to omit long stories or ramblings. The bio page should be a quick and satisfying read. If you got too far in depth about any one interest or passion, you are going to lose your readers; not a risk you want to take. Do not include any negative words or opinions anywhere in your dentist biography. For illustration purposes only, say that you are not a fan of holistic medicine in dentistry. Keep it to yourself. Your website is not the place to mention it. You only want to convey a positive image with your website and bio page. Get in touch with our service today and we will have your dentist biography page up and running before you know it!